When it comes to housing the birds, just about anything’s possible… as long as it’s a proper nest site. This would include ventilation, drainage, clean-out, adequate floor space, and a decent distance from the entry to the floor in order to protect nestlings. 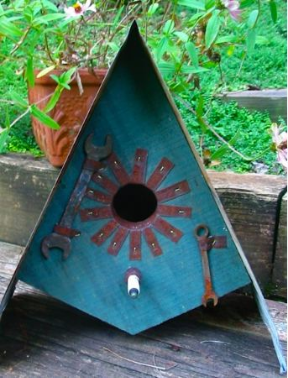 Since one of the most popular trends these days is recycling, the three R’s; recycle, reduce and reuse have spawned some of the most unique and unusual decorative birdhouses. This Mechanic-Inspired A-frame is handcrafted from barn wood and tin, featuring a genuine spark plug perch, old tools, and a metal predator guard made from… I’m not sure what? But it keeps squirrels and others from enlarging the entrance! Using vintage finds for accents can create wonderful conversation pieces, plus swell nesting spots for feathered friends. 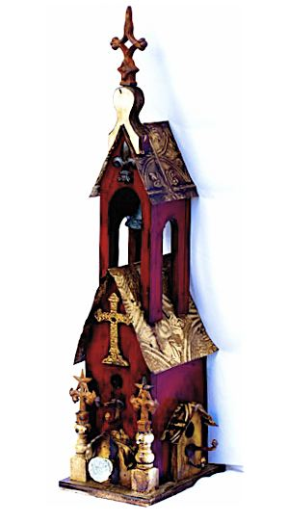 This large, triple compartment church birdhouse is also handcrafted of old barn wood and tin. The vintage iron cross is rich with texture, while the roof lines and windows provide nice detail, it’s even signed by the artist (Jim and Vickie Smith) for 2012. Although it may only host one brood at a time during nesting season, you can bet all compartments will be occupied by resident songbirds on a cold winter night! Even during the off-season, decorative birdhouses are put to good use. They really do make for great roosting spots. Some birds will line their roosts with nest material, while others prefer a bare floor and just gathering for warmth through body heat. As natural nest cavities slowly disappear with every tree that’s cut down, you can help house the birds in any style that tickles your fancy. From rustic or whimsical, to mod and futuristic, there’s a decorative birdhouse out there for you… and your avian amigos! Innovative designs seem to bring about a new twist on old things. 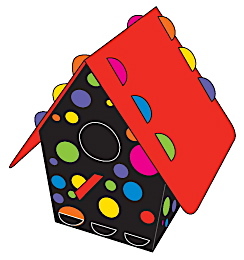 Totally fun and functional, these birdhouse kits are fun for children and adults to assemble. No tools required either! They’re made from recycled plastics, and come in some vibrant colors and designs. They’re meant for feathered friends, to provide real nesting sites in spring. Bird will also use these fun birdhouses to roost on cold winter nights, for protection from predators, and the elements as well. By adding some dried grasses or clean straw, you’ll provide some extra insulation from the cold. 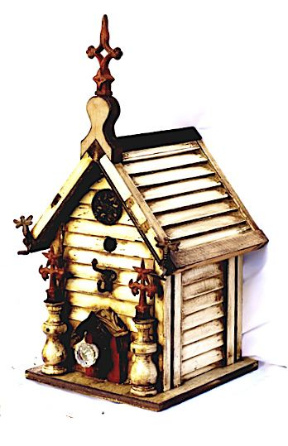 Birdhouse kits make wonderful projects for school or church groups, Brownies, Boy Scouts or any activities group. They’ll help teach a valuable lesson on stewardship for the environment and creating a wildlife friendly habitat with three main elements. Food, Water and Shelter. Help kids learn about native plantings that will provide food and shelter for birds. Water can be as simple as a plant saucer on the ground filled with fresh water. You can help local bird populations thrive and flourish by teaching the next generation about wildlife friendly habitat. 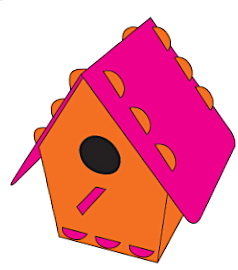 These birdhouse kits just may grab their attention and make the project fun! Cavity dwelling birds face a very sad real estate problem…good homes are not so easy to come by these days. Mostly because of the vast destruction of natural habitat giving way to strip malls, schools, and more subdivisions. But also from the competition of non-native species. Just who brought over those House Sparrows anyway? 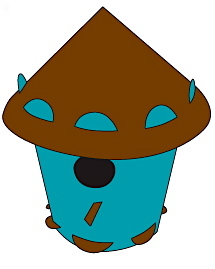 An educational and fun way to provide real nest sites for your feathered friends is with birdhouse kits. The standard wooden kits are widely availabl e, even as bird feeders and bat house kits. Mostly crafted of durable cedar, they’ll provide many seasons of use and enjoyment. Lately, recycled plastics are the new craze in wild bird accessories, and they’re awesome as far as durability. Most are guaranteed to never crack, split or fade, plus they help to keep these plastics out of landfills. No worries of squirrels gnawing on them like traditional wooden bird accessories. 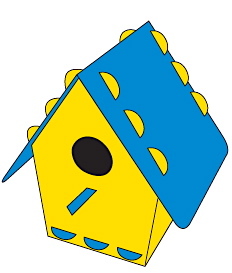 These recycled birdhouse kits have a unique design that’s fun to assemble, for little kids and big kids too. The groovy designs and vibrant colors are just plain fun, and best of all they provide great nesting sites, as well as roosting spots for wild birds. Th e 1.25″ entrance is perfect for many small to medium-sized birds, and the perch is removable. 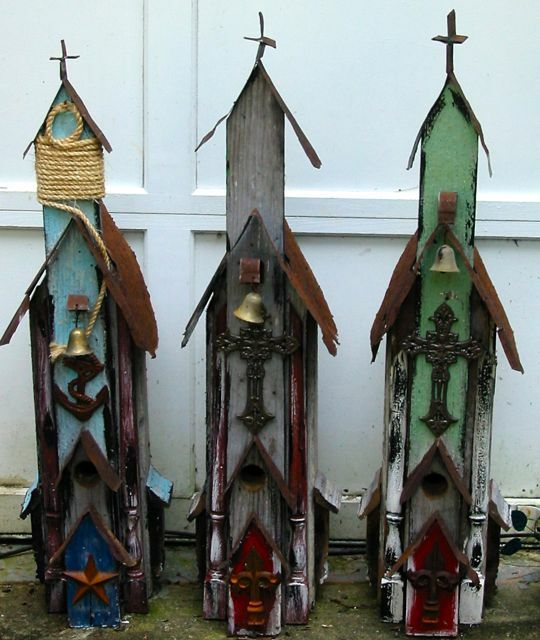 These recycled plastic birdhouse kits add a splash of color in the yard, and will look great for years too. 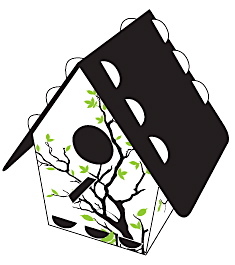 Innovative and fun to assemble, these recycled plastic birdhouse kits provide real nest sites for feathered friends. The vibrant color combinations (and patterns too) will have young and old admiring them for their simplicity and charm. No tools are required for assembly, and they make great projects for a rainy day at home, and for youth or church groups. The non-toxic plastic is safe for birds, and ensures many seasons of use and enjoyment. 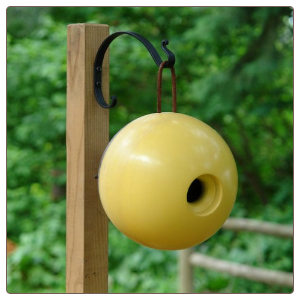 With a 1.25-inch opening, these birdhouse kits are perfect for small to medium size songbirds. The hardest part is picking out the color! With a severe shortage in natural nesting sites, you can help birds to flourish and thrive in your neck of the woods by providing birdhouses for them to raise their young. 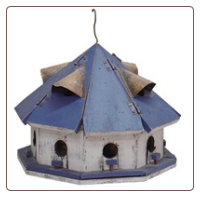 Birdhouse kits like these also provide great roosting spots for cold winter nights. Please help house the birds! For those who may appreciate art, and fancy backyard birding too, there’s good news! The two have merged successfully with imaginative and vibrant creations that are actually meant for feathered friends. Totally fun and functional unique birdhouses abound, in numerous materials and styles too. Many are crafted with amazing detail in durable materials that will last for years of use and enjoyment. This fused glass unique birdhouse actually conceals a wooden birdhouse inside. Special silicone is used to fuse the two, allowing for contraction and expansion of the wood. The really cool thing is that many artists are happy to take custom orders, giving you endless and creative choices to suit your tastes. 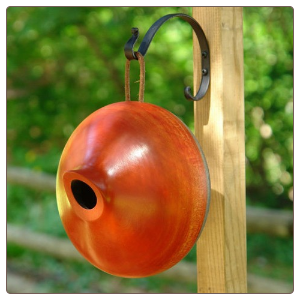 This architectural birdhouse is handcrafted in durable vinyl, just like the siding on people’s houses, so you know it lasts forever with little to no maintenance. This artist also gives you the option of a bright copper roof or an aged patina copper roof. Be it whimsical or classic, unique birdhouses will complement your environment while providing much needed nesting sites for wild birds. …Please help house the birds!